I suppose from time to time we may have opportunity to read interesting biographies of people who have left their mark on society. The lives of some great men and women such as Chaim Weizman, Golda Meir, Winston Churchill, Harry Truman and Ben Chifley, to name a few, certainly make very interesting reading. Of course, none of these knew the Truth of the gospel, but their lives were an inspiration to their generation nonetheless. I am sure that Brother Ron Hicks would not put himself in the same category as the above but in another sense his life has been greater and his influence on the lives of many men and women has been and will be longer lasting. In his recent autobiography My Journey in Faith, Brother Ron takes us on his personal journey of life where the influence of God and His Word shines through. As we would expect from Brother Ron, he does not seek to ‘blow his own trumpet’ in these memoirs but rather seeks to show the wonderful influence and direction of God in his life which led him to be involved in the affairs of an amazing number of people and countries over many, many years. To some extent I suppose that all of us if we had the ability and time could put together a memoir of our life, but as Brother Ron observantly puts it, “I am acutely aware of the imperfections of my service to the Father, and certainly do not feel that my life has registered any grand spiritual achievements. Yet I believe it has been sufficiently different from the norm to be of interest” (page 352). Yes, Brother Ron’s life has indeed been quite different from the norm and the 361 pages of his book which take us on his journey are full of most interesting anecdotes and reflections on life’s experiences which cannot help but inspire us to realise that God does indeed watch over us and “worketh in (us) both to will and to do of his good pleasure”. Brother Ron is ‘an old Adelaide boy’ and starting with his early years growing up in Adelaide he shows that the influence of godly parents in the Truth, a stable and very happy home, and a rich and fulfilling ecclesial life in the Adelaide ecclesia and beyond, were extremely valuable foundations that were of immense help in his life, which later saw him traversing the four corners of the earth in both employment and preaching work. Brother Ron was not one to hide his light under a bushel and although he rose to considerable heights with his employment in the International Monetary Fund, he used the advantages and privileges that came with his profession to further the gospel and enjoy ecclesial fellowship wherever his employment took him over many years. Many a brother or sister and ecclesias in isolation received a visit from Brother Ron on his frequent trips overseas for the IMF, and his experiences both from a professional and spiritual point of view make very interesting reading. I think it is a credit to Brother Ron’s personality and good nature that he was able to mix with and help brothers and sisters from all walks of life and different ecclesial environments; and his ability to also get down to the ‘grass roots’ level with interested friends from such diverse backgrounds also shines through in this autobiography. His reflections on his life in the professional and ecclesial world both in the USA where the IMF headquarters are (in Washington and where Brother Ron has lived for many years) and around the globe are fascinating from both an employment and spiritual perspective. There are many stories of a variety of experiences, some of which are highly amusing and related in Brother Ron’s entertaining style. Over the many years he has been greatly blessed to be able to visit many ecclesias and Bible Schools/Conferences throughout the world both as an avid listener and speaker and his reflections on these experiences are good to read. Brother Ron had interesting and fulfilling employment with the IMF and he was extremely thankful to his God for that, but frequently in his book he makes the point that such a rewarding profession in many respects was a means to an end, that is, to make the gospel known in places where Christ had never been preached before. 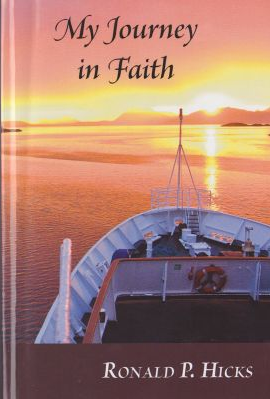 The title of the autobiography, My Journey in Faith, is very apt as in his own special way Brother Ron illustrates throughout the book time and time again the very personal relationship he has had with his God throughout his life. His absolute trust in God through every aspect of his life is a pleasure to read and surely is a good reminder to all of us that God should certainly be more a part of our life than perhaps He is at present. A feature of Brother Ron’s life is that in his own diplomatic way he ‘pulls no punches’ where he sees some comment is necessary, and whilst we may not necessarily always agree with his own position on a matter, we are left in no doubt in this autobiography that here is the life of a God-fearing man whose example of steadfastness and commitment in the Lord’s work is worthy of our consideration. I gained great pleasure from reading Brother Ron’s extraordinary life story and would thoroughly recommend the book to both young and old – to anyone in fact, who wishes to be inspired in the Lord’s work. Published in Vol. 16, No. 6 of The Lampstand, printed November - December, 2010, and uploaded online May 19, 2016 .